This website collects data that can be used to indirectly identify visitors. As with all websites, the visitor’s computer sends to the website computer its numerical address, browser version information, and operation system type, and screen resolution. The web visitor analysis software used by this site may employ temporary ‘cookies’ to track a visitor across the website, to learn which pages are visited and in what order. Questions should be sent to Angela Pippos. Everything Angela does she does with passion and flair earning her the nickname “pocket rocket”. Whether in front of the camera, a radio microphone or a live audience Angela is always entertaining. 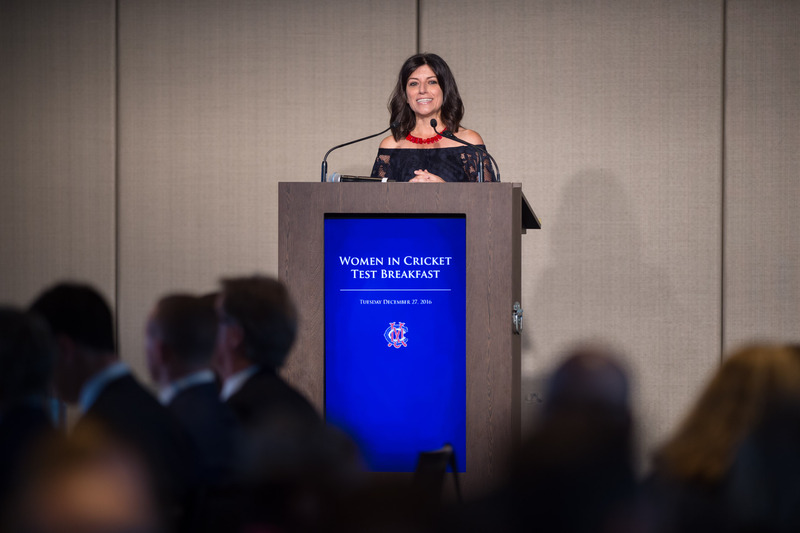 The petite and lively Pippos left her native South Australia in 1997 to pursue a sports journalism career in Melbourne after completing an Honours degree in politics from the University of Adelaide. Her decision to come to Melbourne was the first of many twists in her career. During her 14 years with the ABC Angela worked as a researcher on the 7.30 Report and reporter for the 7pm News but she’s best known for anchoring the sports segment on the ABC TV News in Victoria Monday to Friday and later on weekends. Angela takes great pride in her presentation and was crowned Victoria’s best and clearest TV sports presenter five times. 2007 was an eventful year for Angela. She was approached by the ALP to stand for the state seat of Williamstown vacated by former Premier Steve Bracks. Amid a storm of controversy she declined the offer. 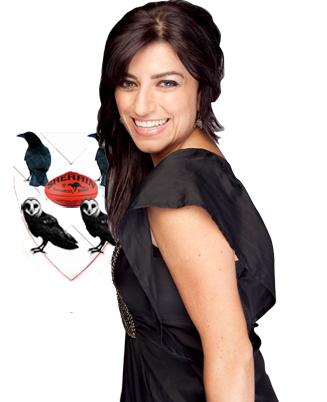 Searching for a new challenge Angela walked away from the ABC in 2007 and went where no woman in Melbourne has dared go – the testosterone-charged world of breakfast sports radio. Angela was the first woman to co-host Sport 927’s breakfast program, a position she held for two years alongside 1990 Collingwood premiership player Michael Christian. Angela has appeared on Network Ten’s Before the Game, TAC Cup Future Stars on the Nine Network and The Back Page on Fox Sports. Angela is now enjoying the freedom and diversity of freelancing. 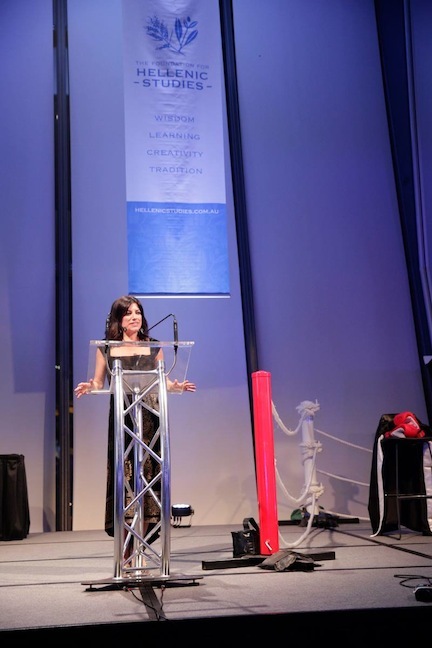 Angela is a sought-after MC and public speaker and divides her time between the corporate, sporting, community and education sectors. 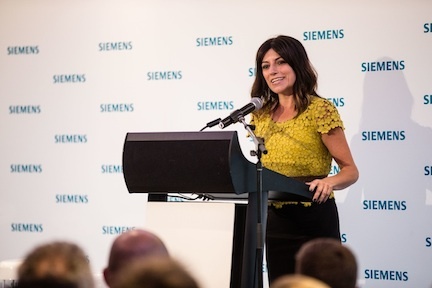 She works for Siemens facilitating events and is the host of the RACV Club’s Remarkable Women Series. Angela writes sharp, witty, thought-provoking columns for The New Daily and you can hear her on 774 ABC Melbourne and 891 ABC Adelaide. 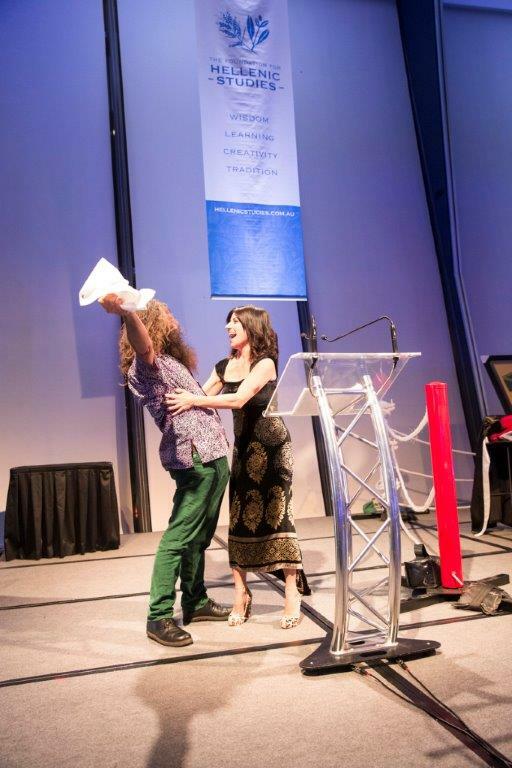 Angela’s first book, The Goddess Advantage – One Year in the Life of a Football Worshipper was shortlisted for the Colin Roderick Award for Australian Literature. It loosely follows her life during the 2005 AFL season. 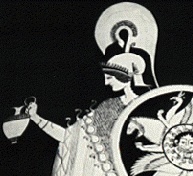 It’s as much about love, loyalty, stuffed tomatoes and Greek mythology as it is about Australian Rules football. Angela has just released her second book – Breaking The Mould: Taking a Hammer to Sexism in Sport. 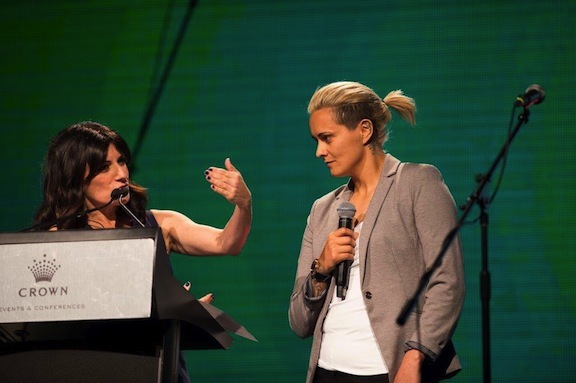 In February 2017, her documentary about the rise of women in football, League Of Her Own, screened nationally on the Seven Network. In 2013 she produced her first feature film, The Day of the Broken. 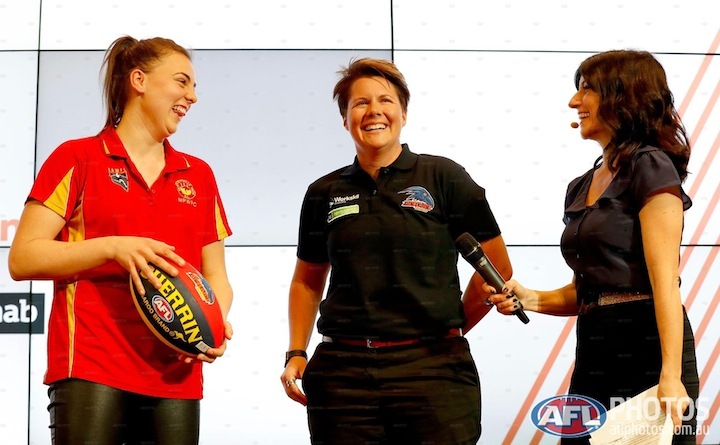 Angela is a proud ambassador of the Adelaide Football Club. Right-click and save the video file. Left-click and view the quicktime file – fast connections only. Angela is a lively and engaging MC and guest speaker. Whether it’s sport, food and wine, feminism, politics, multiculturalism, education, health, books or fashion Angela is always on top of her game. She researches meticulously and then adds her trademark spontaneity and flair. 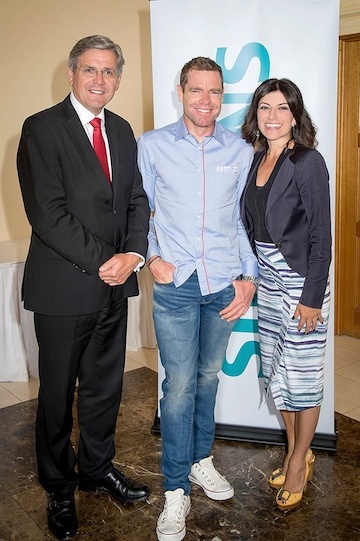 Some of her recent events include the Siemens Night of Champions featuring Cadel Evans; Western Health Service Awards; MCC Women in Cricket Breakfast (11 years straight! ); Word For Word Non-fiction Festival; JDRF Gala Ball; Ithacan Philanthropic Society Centenary Celebrations; RACV Club Remarkable Women Series; Australian Education Union Federal Women’s Conference; The Good Sports Awards; MVCC Business Networking Evening; NAWIC Awards; SCA National Convention; McGrath Foundation High Tea; Museum of Australian Democracy at Eureka In Conversation with Clare Wright; Australian Republican Movement Debate; Sport Without Borders Great Debate; The F Word: Sport, Sexism and Feminism at The Wheeler Centre; AFL Multicultural Round launch and Victorian Sport’s Iftar Dinner. Angela is also the MC for all AFL Women’s events. Take a look at what others have said about Angela.